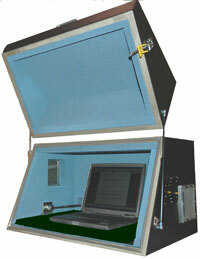 The Model 5225-2 Access Point Test Enclosure is a Bench-Top test system that has been developed for testing medium-sized wireless devices, such as laptop computers. The unit is constructed of durable welded aluminium and features a large clamshell lid with pneumatic springs and dual locking latches. Flat RF absorber lines the interior and greatly reduces resonant behaviour in the cell. The Model 5225-2 standard configuration consists of two sets of printed patch antennas circularly polarized, covering the 2.4 GHz and the 5.8 GHz bands. An option is available for a printed broadband linearly polarized patch antenna covering the cell phone frequencies from 700 MHz to 2 GHz. The Model 5225-2 can be customized with different antennas to test other frequencies.